2nd Life Bikes. April 2014. Photos by Paul Goldfinger ©. Left click Re-post from 2014. 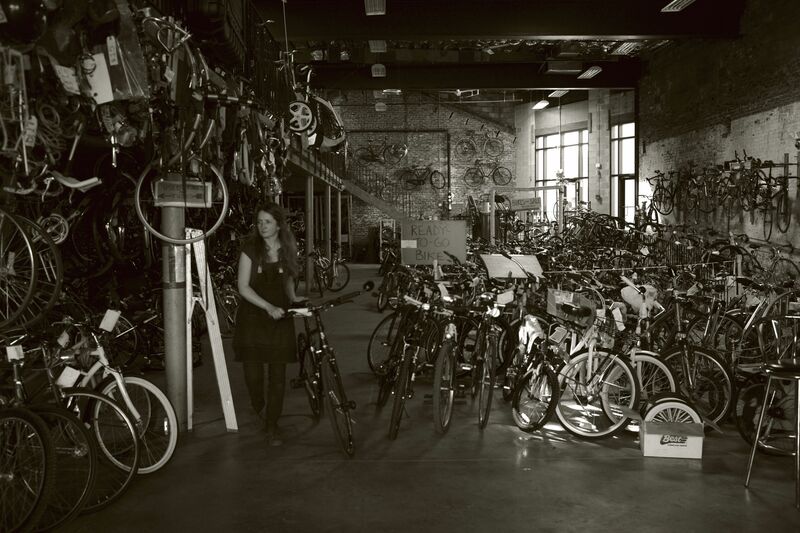 Kerri Martin, the Director of Second Life Bikes” at 21 Main Street, right outside the OG gates and a little to the right, presides over an ocean of used bicycles within a cavernous space that looks like it could house a brewery or an armory. 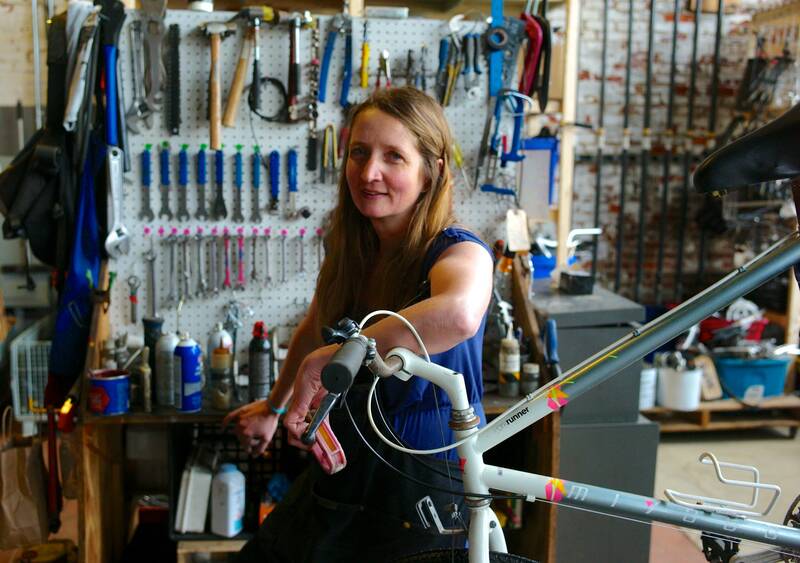 Kerri founded this “community organization” in 2006 when she ran it out of a garage as a sort of bike church. People donate old bicycles to the group, and they are fixed up by a team of 3 experts: Kerri, Pete and Terry. Then the bicycles can be purchased from $60.00 up or given to kids free through the “Youth Earn a Bike” program. Kids ages 12-18 must work 15 hours to get a bike. They learn how to use tools and restore life to damaged cycles. Kerri is quite famous around these parts for her witticisms which she writes by hand on a blackboard outside the shop. She says that she is giving vent to her “inner comedian.” The program has been covered by national media, but now Blogfinger gets a shot. I brought over my son’s Huffy which had been ridden twice before the brakes failed. 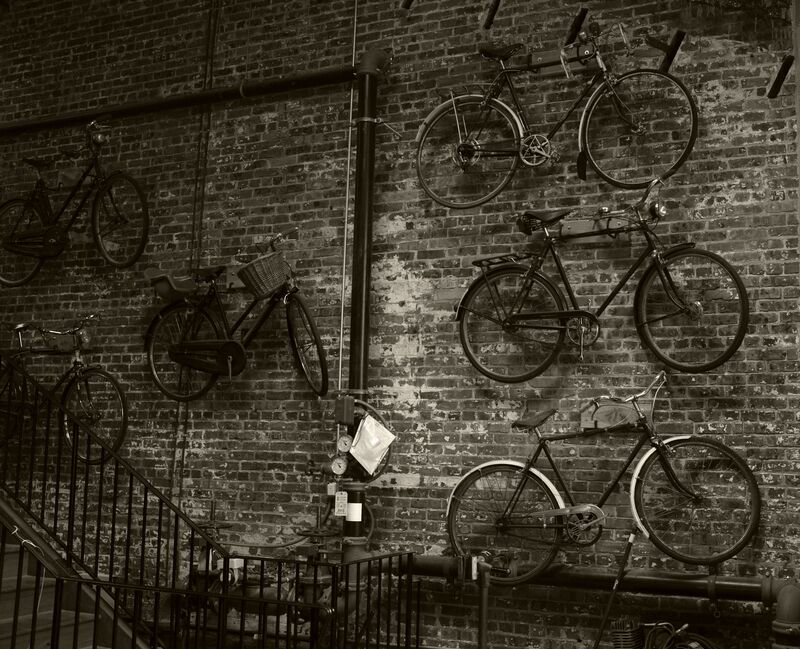 Pete, a bike repairman and raconteur found that the bike was fine, but it had been assembled wrong. So much for the great deal at Walmart. Pete is originally from Jersey City and he used to do darkroom photography, so we had a few things to talk about. Pete has a short graying pony tail; maybe I should get one of those. Kerri isn’t sure what this building was used for in the past, but it stood empty for many years before Kerri and her biker gang took over four years ago. I felt like Bob Bowné at the silk mill when I roamed around taking photos. 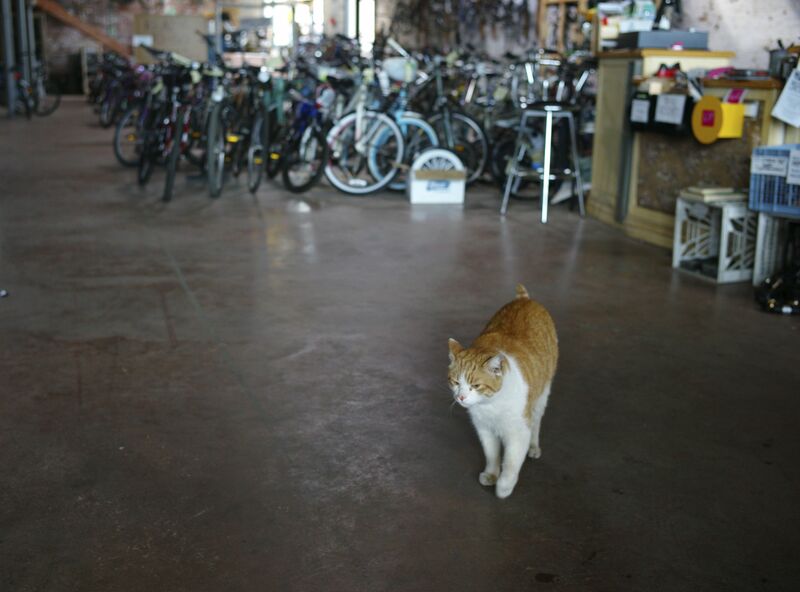 But unlike the silk mill, this strange building has humans and cats roaming around still. Kerri said that another blogger was due in for an interview and photoshoot, but, at least for today, Blogfinger got the scoop.